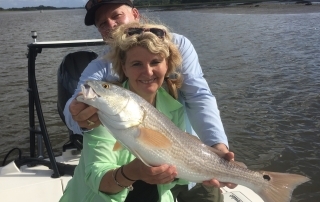 We had a great spring on the water here in St.Augustine.The weather thru March and April was mostly windy with temperatures below normal.May and the first part of June the wind layed down and the temperatures got up to normal.The redfishing was red hot with lots of happy customers.The redfish were found in a variety of different places from deeper water structure out on the intracoastal,shallow water flats off the intracoastal to backcountry creeks.I probably spent more time in the backcountry creeks than any due to big fish in the 25 to 33inch class being stacked up in these spots day after day.Many of these days on a half day trip we pulled into a spot put the power pole down and did not move till it was time to go to the dock.We caught a few trout and black drum this spring but the bite was on and off.With the redfish bite as good as it’s been not a big deal.I expect the good redfish bite to carry over into the summer.If this summer is like last the black drum in the 2 to 5lbs range are going to pick up and last thru September.Remember when you book a trip book with a individual professional guide that fishes and makes a living doing it every day not a part time guy working two jobs and learning the water on your dime. This has been as good a month of May as I can remember for redfish. The fish have been running from small 17” up to 33”. 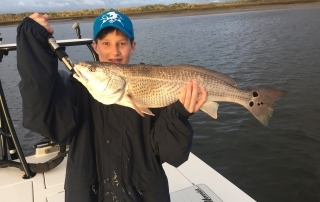 Fishing has been good in all the typical places we find redfish. 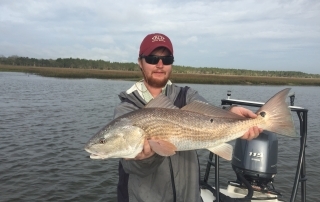 From the shallow water flats to backcountry creeks to deeper water drops along the intra-coastal. These fish have been caught mostly on jig heads with live shrimp, spinner baits, and Gulp jerk bait. I know the flounder have been doing good out around the inlet, but I think we might have caught one flounder all month, and 1 keeper trout. Most of the charters this month have been half days. 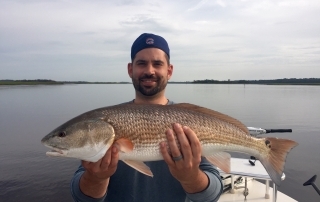 With the limited amount of time to fish I have set up all the trips around a good redfish tide. When the redfishing is as good as it has been, it’s hard for me as a guide to go anything else! 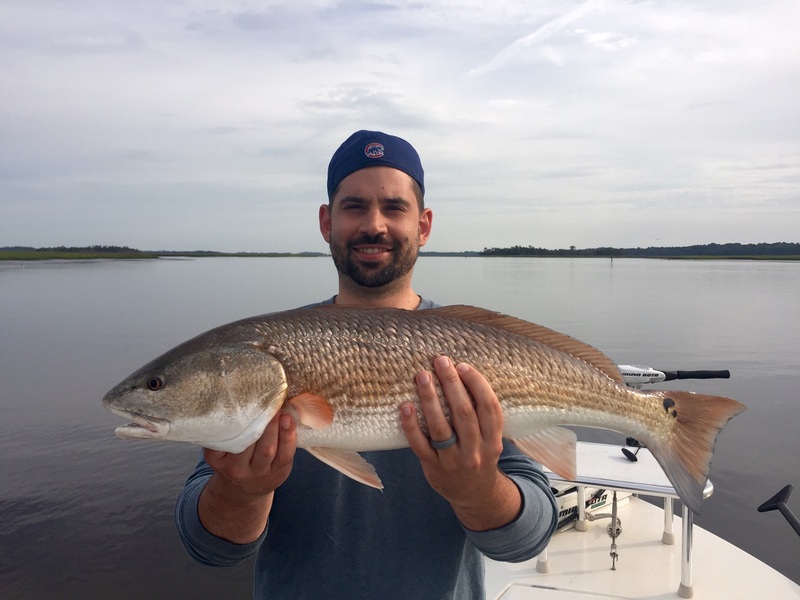 April has always been one of my favorite months of the year to fish the inshore waters of St. Augustine and this year has been no exception. The big speckled trout have started showing up this month with a number of fish being caught over 5 lbs. The go-to baits have been mirrolure, top dog junior and mirrodine sinking hard plastic jerk baits. These large trout are all roe filled females and I persuade my clients to release them due to these fish being the breeding stock. Also these bigger fish just are not that good to eat. 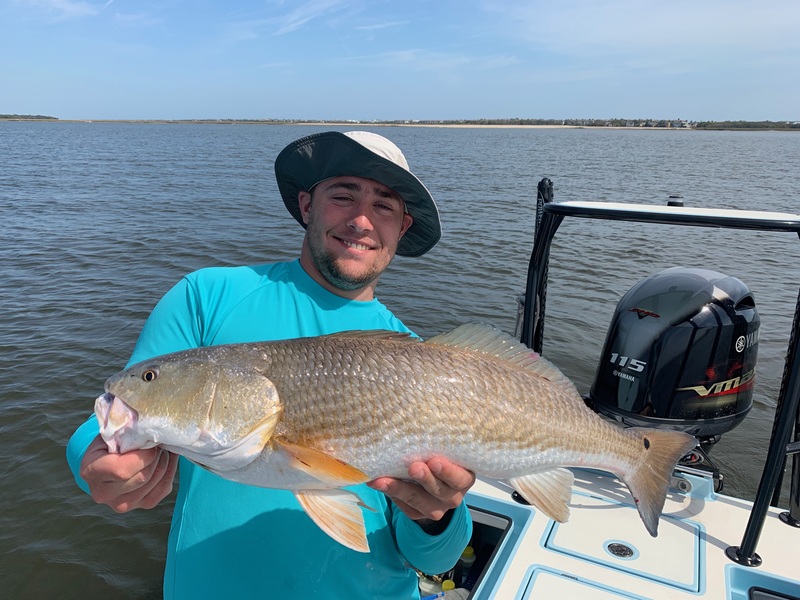 The redfishing has been on fire this month with most days producing 10-15 fish in the keeper slot range with some days as many as 20 on a half day trip. These fish have been pretty consistently in the 24 –25” range. Along with the keeper slot size fish we have also been catching quite a few undersize fish with a few over slot (over 27”). All these redfish have been caught on ¼ ounce jig heads with shrimp. 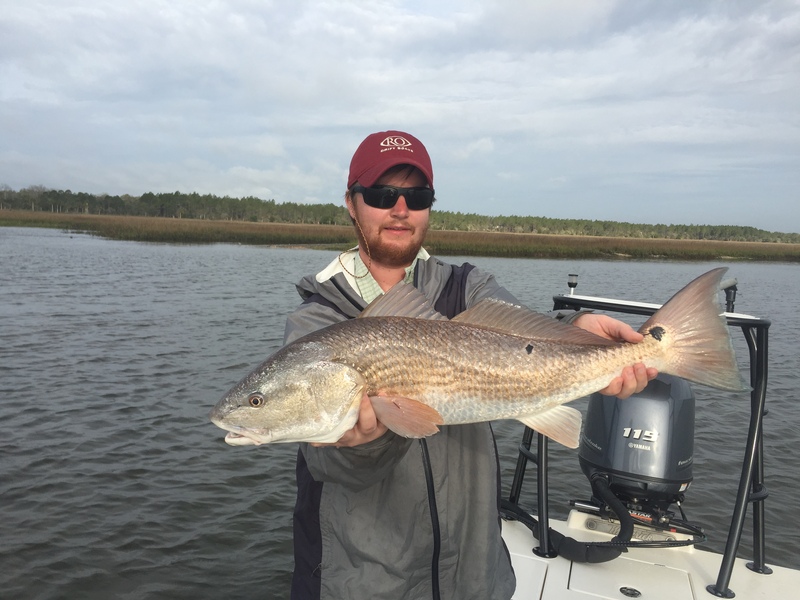 About half the redfishing this month has been in deeper holes in the back country creeks and the others on shallow flats of the intracoastal. 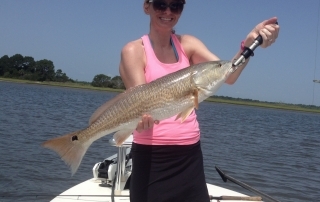 We also had the second leg of the redfish pro tour on the 9th of April out of St. Augustine. We had a 6th place finish. We had plenty of opportunities to finish higher but had a number of quality fish just pull off. After our February 1st place finish we are still 2nd in terms of our our team and the year’s points! 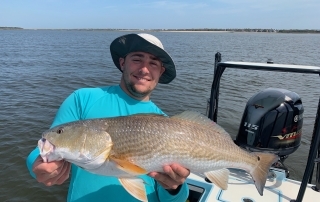 The first three months of the year have been some very good inshore fishing.There were some days we had to really work for our fish, but overall it has been very good! 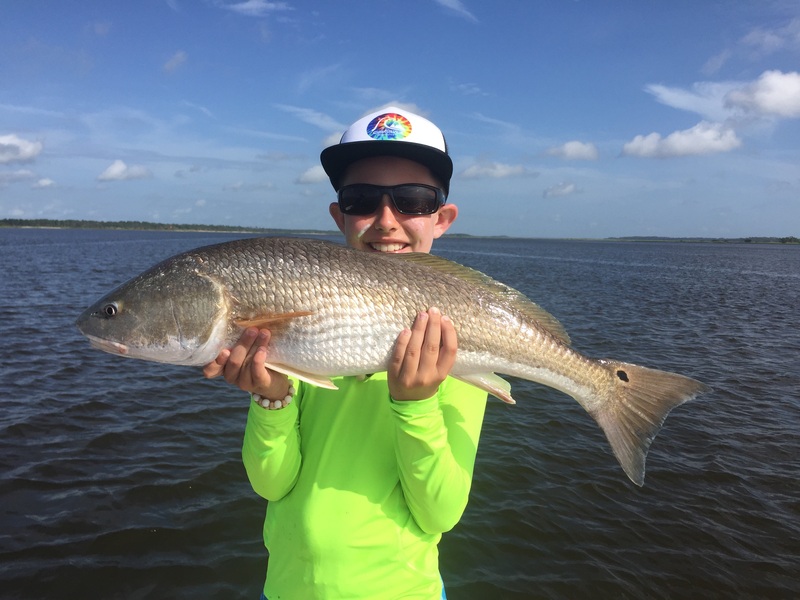 The majority of the redfish we have been catching have been in the slot between 23” and 25”with a few over slot in the 28” – 31” range. 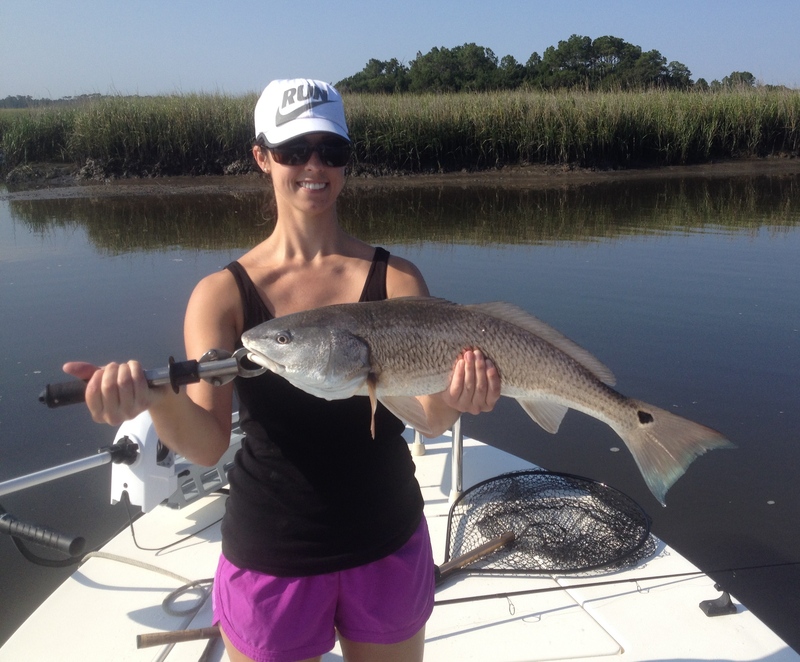 Along with the redfish there have been some great days with a mixed bag of black drum – 3 – 5 lbs, and sheepshead – 3 – 7 lbs. 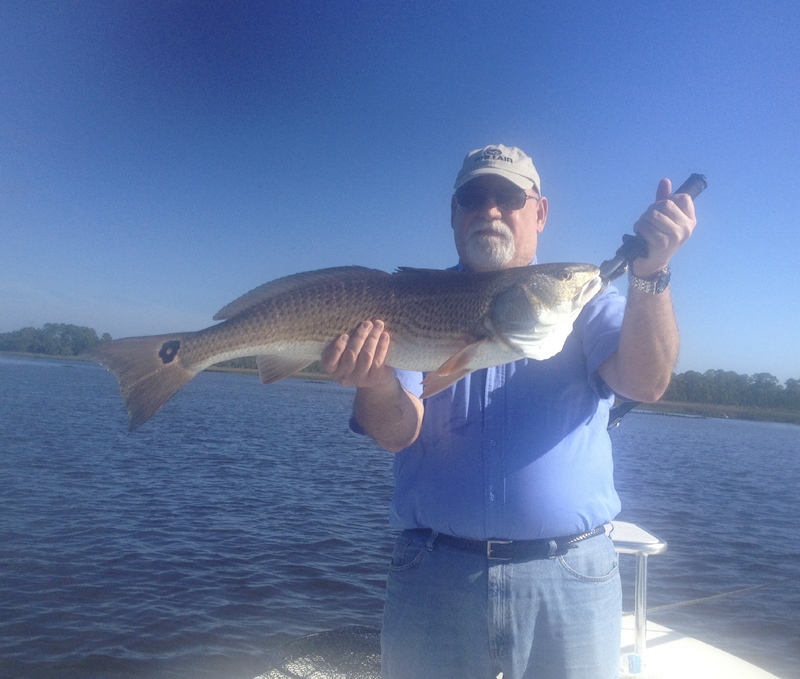 Most of the fish have been coming out of back country creeks or deeper banks up the intercoastal. I have spent a lot more time this year fishing deeper water due to these deeper water fish that have been predictable and a lot easier to get on. The flats fish have tried to do their thing but there has been so much pressure on them they will only stay around and put up with it for so long. Guides that fish these fish every day pattern these fish and know where they are gong to be on every stage of the tide. 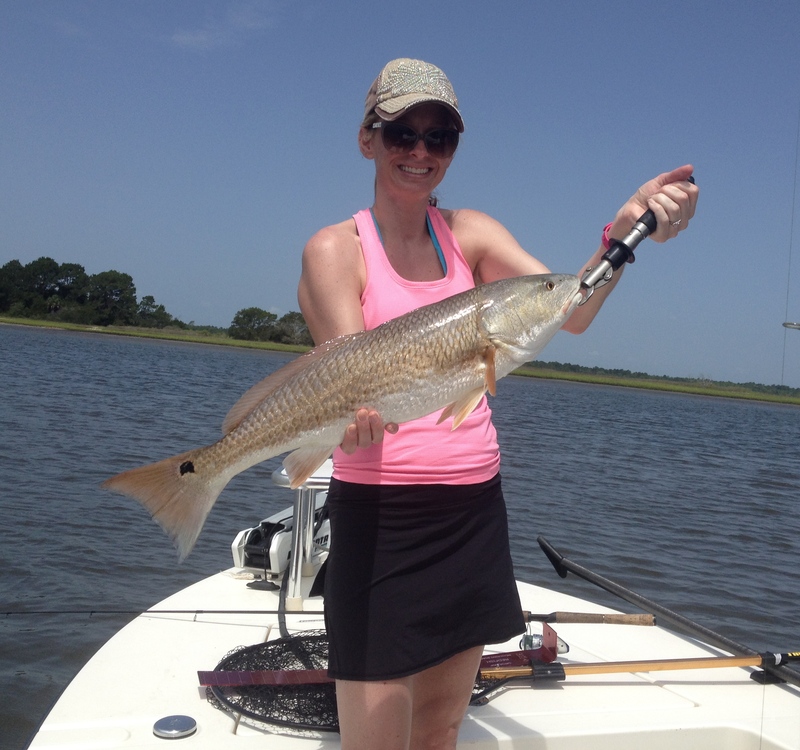 Redfish are creatures of habit. When you spend enough time on the water and know this, you can set up on these fish – not spooking them – and catch them. When you first go on a flat looking for fish and start pushing them around its over! They know you are there and they are nervous. They are not going to bite! This month has been a windy one by May standards.We had a lot of days with an East/Northeast wind. The wind out of that direction keeps the water levels higher than normal and did make the movement hard to pattern. Some of these days were challenging and we worked hard to catch fish. The days this month with normal winds and normal tides were as you would expect for May. 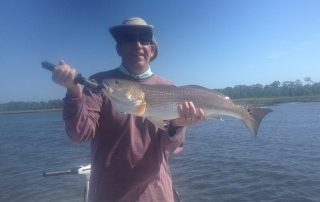 We did well in the backcountry creeks catching nice redfish here and there. But the big numbers and big concentrations of fish came off the flats in the 24 to 33” class. When the wind didn’t blow and the tides were normal, these fish movements were very predictable and easy to set up on every day. Some of the places we fished in the backcountry for redfish usually produce black drum mixed in. That didn’t happen this month, but I expect that to change any day. I had a few reports from other guides of a few stretches during the month of a good trout bite with a few really big fish in the mix. 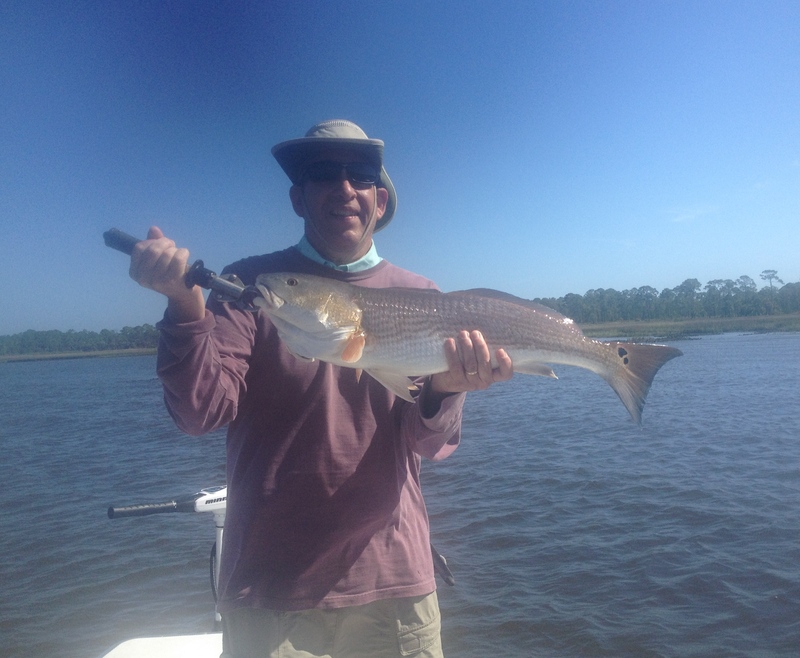 I caught very few trout due to the way I fish targeting redfish 100% of the time. There just aren’t a lot of trout on these flats where the redfish schools live. 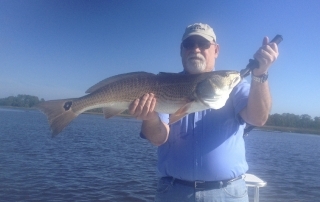 As I am writing this the first week of June I have been fishing a school of redfish that is huge for this time of year. I’m guessing about 75 fish in the 25” class! The month of April has started off with fantastic redfishing. So far this month I have been fishing the same 3 flats every day. There has been plenty of fish so I have seen no reason to change up and go looking. I’ve been working two different size class schools of fish. Some of the schools are in the 24-25” class and some are in the 28-31” class. On the spin tackle (bait) charters, we have been staking out and making long casts to these fish and just letting the fish come find the bait. On the shallow water flats – it’s the only way to do it. Constant casting only spooks the fish. On my fly fishing trips I have been fishing the same fish, but we are poling these areas very quietly and spotting and casting to the fish before they figure out we are there. I have heard good reports that the trout fishing has really picked up in the last couple of weeks. 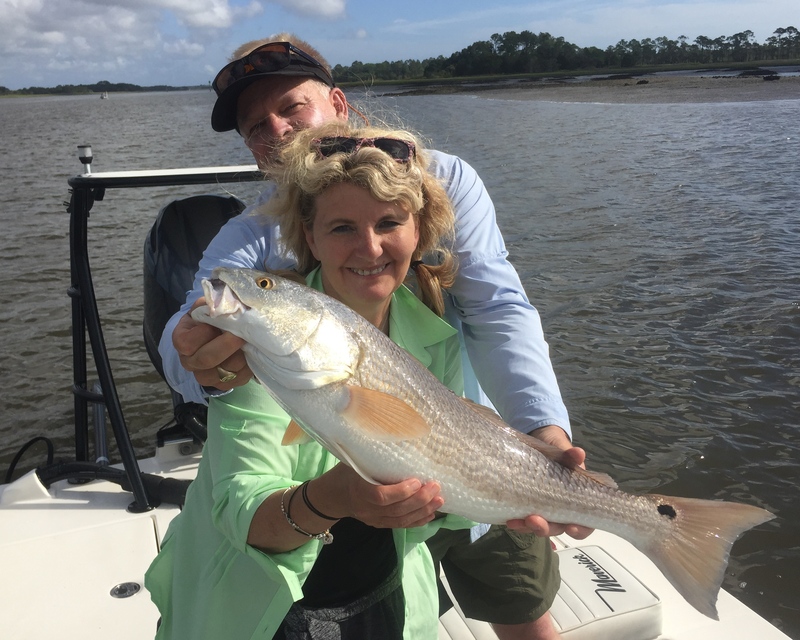 But when the redfish bite is as good as it has been – it’s really hard for me to go trout fishing. The first three months of the year overall have been great fishing. We have had a few challenging days when the cold fronts have pushed through and the wind blew hard out of the north. 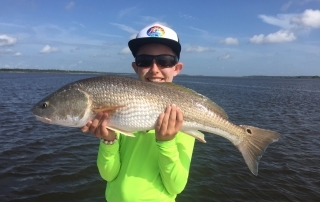 When the weather has been stable the redfish schools have been very predictable and hungry on the flats. These school fish have been running between 25 and 35 inch fish. This is absolutely my favorite way to fish. Schools of fish in shallow water that you can see before you get a bite whether you’re throwing live bait, artificials or flies. 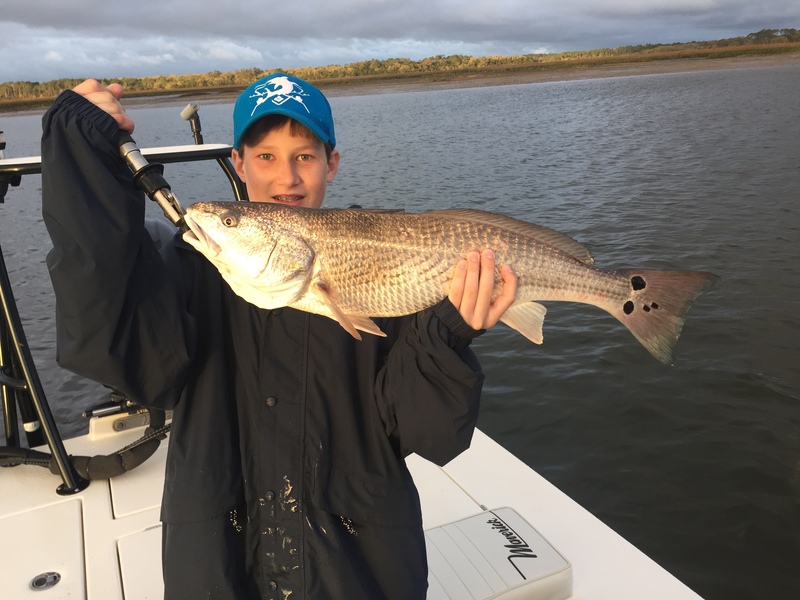 On the higher water – the deeper spots along the Intracoastal, and in the back country, the creeks have been holding quite a few redfish also with a lot of smaller fish in the 17 inch range, but all the way up to 33 inch fish as well. These back country creeks have made the day many times when the wind was really blowing too hard to fish shallow water flats. 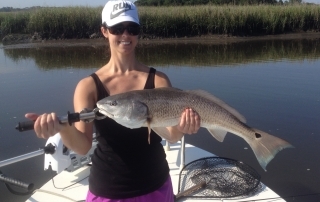 Usually through the winter months these back country spots also hold a lot of black drum. But this year they haven’t showed up in big numbers like they usually do. We have caught a few but not the normal.